This is an improvement to #5129: The8bitbeast's SMS Sonic the Hedgehog in 15:03.71 of 36.43 seconds. It only appears to be a 26.08 second improvement, but the timing of the previous TAS did not include the BIOS, which loses 10.35 seconds. Below is a breakdown of the time saved on each level timed from fade in to fade out. There’s another timing method called RTA-TB which is what the RTA speedrun community uses. This is essentially what I optimized for with the slight alteration that I still ended inputs as early as possible. This is the time of the run minus the time which is spent ticking down the time bonus. I still tried to minimize the time that the ring bonus was ticking down in Bridge 2 (this didn’t cost any time). But I didn’t slow down to reduce time bonuses. Below are the times for this TAS using the 2 timing methods. I could have gotten into the ending portal 9 frames faster if I hadn’t ended inputs early, so my RTA-TB time will assume I kept holding right to get in sooner. A similar resource was Kroc's disassembly: https://github.com/Kroc/Sonic1-Z80-ASM This was a massive help in figuring out the Bank Error Glitch. Many of these glitches have been discussed in previous submission texts, but I like to keep all information in one place as much as possible. If you’re only interested in glitches that are new to this run, see the last few in this section (starting with Bank Error Glitch). 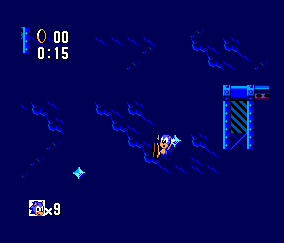 If you stand on the edge of a rising platform and let it push you into a roof, sonic will clip into it. If you try to press into the wall then you will clip back out, but it you stand there on some platforms you will eventually zip up. I often look up while doing this in the TAS, but that was for lag reduction and it doesn’t have anything to do with the actual zip mechanics. It only seems to work when coming at a corner while going left and it doesn’t seem to work in levels other than green hill 2, even with very similar corners. You know that thing in most TASes where you try to jump off a ledge and get down lower as soon as possible. Then it’s better to jump so that you land barely further than where the edge ends because then you have big downwards y speed. But if you just ran off the ledge you would have 0 y speed when you leave the ledge and have to build speed after leaving the ledge (see super Mario bros tricks page for an example). Also a similar concept happens when you’re trying to go under/above a wall and you shouldn’t bonk on it. I’m going to call that the “Ledge Velocity Thing” to save time. This new glitch was the motivation for me to redo this TAS. Each tile in the level has an associated “solidity type”. Contrary to the name, this is more of a special effect than something to do with collision. There are 27 possible solidity types which are shown in the table below. Any value higher than 1B cannot be achieved glitchless and if it was achieved it would have no effect. Note: The lua function isn’t perfect if the memory reads from the system bus point to RAM, not ROM, but the lua representation is accurate enough to understand the glitch. Notice the 3 highlighted sections that involve reading from ROM. In the actual game code they read from the system bus usually around the Bxxx area, but what occupies this area is changed depending on what ROM bank is loaded. This shouldn’t be an issue because we see at the top of both code images that bank 15 (0x0F) is loaded. However, there’s an interrupt that happens every frame. This interrupt sets the bank to 0x02 for its own purposes and it doesn’t set the bank back when it’s finished. The interrupt usually happens towards the end of the frame, but in extremely laggy areas it can happen near the solidity code, or even before it. If the bank is changed after the solidity code sets it to 0x0F but before any one of the 3 ROM reads, the game can return wildly different values for the solidity type. This means that for each tile there are theoretically 4 possible solidity types that could be returned (depending on where exactly the interrupt happens). 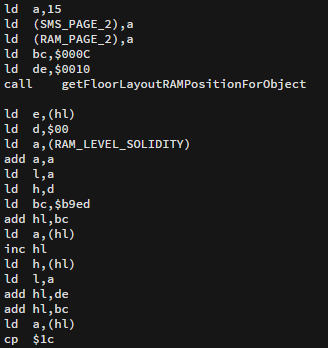 There could theoretically be more if the solidity address in the system bus pointed into a changing area of RAM, but in all of the levels it only points into RAM once (in sky base) and that points to an unchanging part of RAM (the level tile layout). In practice there are only 2 possible solidity values for each tile. This is if the interrupt happens after the bank changes to 0x0F but before the first relevant read from the system bus (the first “ld a,(hl)” ). For some reason if the interrupt happens after this, the interrupt doesn’t change the bank to 0x02. This glitch is theoretically useful in almost every level if it can get laggy enough, but it’s often slower. It is used in the TAS in Bridge 1, Labyrinth 1, Labyrinth 3 and Sky Base 1. I checked for other pieces of code that the interrupt could break and I couldn’t really find much. In terms of actually TASing with this glitch, I’d like to especially thank Isotarge for integrating massive helps into scripthawk for getting this glitch. Scripthawk will calculate exactly what possible solidity types are available on each tile. Also, I essentially now use scripthawk to watch exactly the amount of cycles between the start of the solidity code and the interrupt. I then reduce this number to be between roughly 0 and 30. I really can’t stress enough how precise this glitch is. It involves creating an exact amount of lag down to the precision of roughly 30 cycles. For reference there can be over 60,000 cycles in a single frame. General strategies for managing lag rely on using the pause buttons to line up animation timers. I usually aim for something inbetween 100-300 cycles away from working. From there I can press 1 to jump on previous frames that I’m already in the air. This usually adds about 10 cycles of lag, but it doesn’t work if you use it for more than 1-2 frames. I can also roll the frame before the desired glitched frame, but this usually causes about 1000 cycles of lag. Finally I can pause just before the target frame. This reliably causes about 100 cycles of lag. It might sound reasonable that a shield would make this glitch easier. But even though the shield causes a lot of lag, it seems to be mostly after the solidity code, making a shield not very helpful for this glitch. It does cause about 300 cycles of lag in the correct spot, but I wasn’t desperate enough to need those 300 cycles anywhere to make having a laggy shield leading up to that worth it. I’ll start this section by saying this glitch does not practically work, but it theoretically could. This glitch is a special case of the bank error glitch. One of the possible solidity types is 0B, which is used for the warps in Scrap Brain 2 (the tubes, not the doors) and the end of Sky base 3. The big problem with most of these warps is the large y-coordinates. Most levels aren’t tall enough to reach the coordinates other than sky base 3 warp. There are 2 possible ways that this glitch could save massive time if it worked. The main one would be to get the sky base 3 warp. 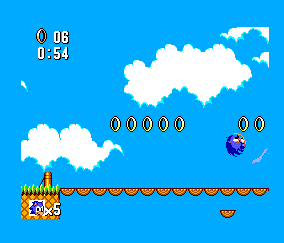 If you get that warp, sonic goes to the next level instantly without a bonus screen. This obviously saves time, for example if it was possible in bridge 2. But there’s an even bigger effect. If you got the sky base 3 warp and skipped a level, then every level after that would have the bonus screen skipped, even if you finished that level normally. Furthermore, finishing a level will take you to the “next level”. Due to the way the level indexes are laid out, you would skip from scrap brain 2 to sky base 2, skipping 2 levels in between. Also, after finishing sky base 2 you would go straight to the credits, skipping sky base 3. 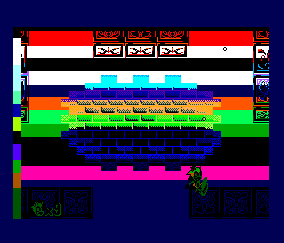 Another side effect is that Scrap Brain 1 has glitch graphics. If you could get a sky base 3 warp in green hill 1, then it would take this TAS from 14 minutes down to roughly 8 minutes. If you could get the glitch in more levels it would save even more time. The coordinates needed to get this glitch in Green Hill 1 are in bounds, but the tile in that spot can’t give a solidity value of 0B. Frustratingly, the tile next to it theoretically could give 0B. So if Green Hill 1 was 10 more pixels to the right, this TAS would have saved 6 minutes. Another application of the glitch would be to get a scrap brain 2 warp which takes you to a separate room (either the second or third row in the table above). This would take you to the corresponding room in scrap brain 2 from any level. However, the game still thinks you’re in the level you warped from. So if you finish scrap brain 2, you’ll go to the level after the one you originally warped from. This would seem like it doesn’t save time, but the complication happens with special stages. 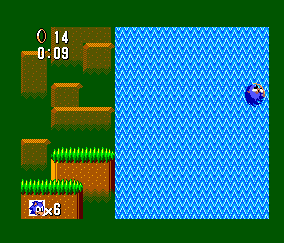 If you could warp to scrap brain 2 from special stage 2, the game will think you’re in Green Hill 3 while having the layout of Scrap Brain 2. 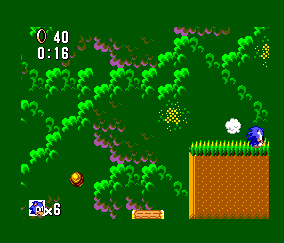 But by finishing the level with over 50 rings you can go to a special stage from what the game thinks is Green Hill 3. This means that special stage 4 can be accessed from Bridge 1 and so on. Usually there are only 8 special stages and after Labyrinth 2 you can’t get into the special stages after that. If you pulled off this glitch, finishing Labyrinth 2 with 50 or more rings will attempt to take you to special stage 9. This doesn’t exist and it happens that the level after special stage 8 is the credits. This would save a lot of time as it cuts the last 2 zones off the run. I tested the coordinates of all warps on all levels (even the useless warps) and checked all possible solidity values. I didn’t find any levels that had a possible solidity value of 0B lining up with the correct coordinates. I also checked the Master system BIOS ROM and Game Gear v1.0, v1.1 and prototype. One possibility is that you could spawn a fake falling bridge tile on the correct coordinates (like this: https://youtu.be/0pHS3cRW628 ). This might change the tile index, which changes the possible solidity values. This could lead to a possibility of OB. I’ve checked the Master System version pretty carefully for this, but I haven’t yet checked GG as closely. 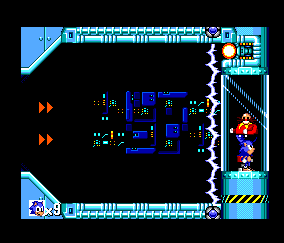 This was previously thought to be Game Gear exclusive, but there’s a very similar glitch on Master System. 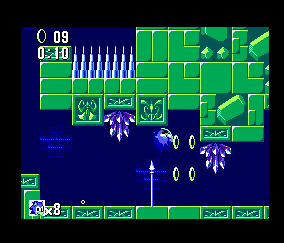 On Game Gear, if you jump onto an upwards spring there’s a frame where you can enter a rolling state. This puts you in a rolling state in the air which lets you break the speed cap. This method doesn’t work on Master System because if you jump onto a spring, the frame for the roll doesn’t exist. However, if you fall/roll onto a spring from an upper ledge without jumping, this frame does exist. This is also possible if you bounce on a spring, then fall back down and bounce again (see Labyrinth 3). At 0x1223 in RAM, there’s a frame counter. This mainly affects loading objects. Most objects will only load on one out of every 8 frames. This varies for different objects in the level and it seems to depend on which number object it is (e.g. the signpost from GH1 and GH2 load in different spots on the frame rule because they’re in a different place on the list of objects for the level). Although all objects load in modulo 8 frames, this doesn’t affect too much. Even though the signpost may take slightly longer to load, you have to run to it anyway. But if you outrun the screen (like Green Hill 1) then you have to wait for the screen to catch up for the signpost to load. If you hit a bad spot in the frame rule you could lose 8 frames here. This actually caused me to lose 6 frames in Labyrinth 2. The other non-glitched version of the frame rule is the bosses loading. Even if you haven’t outrun the camera, the boss frame rules will always save or lose time because the sooner you trigger the boss, the sooner Ivo will be at a point in the cycle where you can kill him. The other small application is lag reduction and avoiding enemy projectiles by loading them later. For example, I wait 3 frames in sky base 1 to avoid a cannon shooting bullets directly into my path. Unfortunately, unlike Metroid, the frame rule does not increment while the game is paused. If it did, then there would be massive time saves (e.g. boss skips). This level has a lot of hill speed cap alternation. At the top of the big hill I break the invincibility box to reduce lag. This does cause slightly more lag later but it’s much better than having the box on screen the whole time. Rolling off the hill causes enough speed to outrun the screen. RTA would completely hold right until the end but I occasionally slowed down to eliminate lag frames. This caused me to take much longer to reach the signpost, but it doesn’t matter because the screen has to scroll to the signpost before it loads. I still have enough time to come to a complete stop while touching the signpost as the signpost loads. An initial jump sets up y-subpixels to allow for the big jump down the hole to happen one frame earlier. The goal for falling down the trap hole is to hit the ground below as soon as possible, because a 1 frame jump is done on the first frame of hitting the ground. Down by the water I set up position so that I can jump and hold right, then roll on the frame I land. I manage to do this just as my speed hits 0308 which gives me a fast speed for starting the roll. Further into the water I do a small jump to avoid exiting the water too much as sonic slows down much faster in the air. In the middle water platform I delay rolling for a while to reduce lag. This doesn’t lose speed as you decelerate in water while walking at the same rate as rolling in water. Routes 1, 3 and 4 are very similar and the intended route was faster than both of the 1 clip routes. The 4 routes are directly comparable as they converge when they hit the last up spring (the one nearest to the top of the level). Out of these 4 routes, route 1 (the intended route) was the fastest. 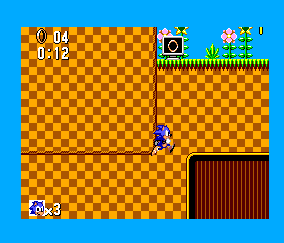 However, there is another glitch which affects this which allows sonic to roll off of the top spring and gain lots of speed to the right when leaving the underground section. Route 2 (2 clip route) is the only route which comes towards the spring heading right, which allows it to set up a roll on the spring slightly quicker. But on top of this, route 2 is able to roll across the gap with the wooden platform without jumping across. This is because route 1, 3 and 4 have the wooden platform on screen when they take the middle up spring (2nd up spring in the intended route). This causes the wooden platform to move more towards the right, making the roll across the gap impossible. So even though route 2 is slower than route 1 by about 50 frames at the last spring, the roll across the gap makes route 2 11 frames faster than route 1 overall. I managed to barely get an 0:18 in game time by not slowing down for the signpost, but in the final TAS I had to slow down which caused an 0:19 IGT. Lag behaves differently in boss levels. 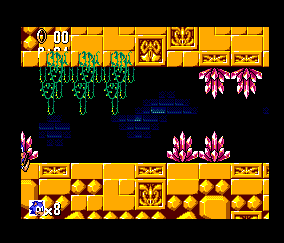 Instead of stopping sonic moving for a frame, sonic keeps moving but the game tries to interpolate the inputs. As a result I don’t have to worry about lag reduction, except when using speed cap alternation because the interpolated inputs drastically interferes with the 60hz mashing. Ivo flies too high to hit on his first flying phase, but on the second phase he flies 1 pixel lower which is just low enough to hit at his minimum height. There is a window of several frames where Ivo is at a minimum, but Sonic’s y subpixel has to be at a good value before the jump to have a chance of hitting Ivo. Sonic’s y position on the ground varies anywhere within the range of a pixel, but only the higher portion of this range will cause there to be frames in Sonic’s jump where he’s high enough to hit Ivo. This is easy to execute in the TAS (hence the jump just before the jump that hits Ivo), but the subpixel inconsistency is the reason why RTA runners often struggle to hit the boss, despite having consistent jump timing. After jumping off the capsule the screen fades out based on the timer at 0x01289. However, pausing can cause this to happen quicker! It seems that the value at 0x1298 influences this and the fade out happens much faster if that value is 1. Usually the value increments every frame in non-boss levels, but it doesn’t increment in boss levels unless the game is paused. For most of the level the value is 6, so by pausing for 4 frames it wraps around to 1, causing the fadeout to happen quicker. The level starts with some speed cap alternation boosting, gaining a few subpixels overall. This leads to some more potential lag, but by some precise jumping all lag frames can be avoided. When rolling, I sacrifice a lot of speed so that I can land on the fish. This puts the old TAS much further ahead just at the start, but the extra speed from the fish bounces carries through the entire rest of the level, saving over a second. Using the fish bounce height I can bounce off the shield box and build up even more speed. Getting the shield causes a lot of lag, but the speed is definitely worth it. I was able to lose the shield later in Bridge 2 without causing any frames of lag around losing the shield. On the falling bridge, I aim to get a solidity glitch to have a spring boost me up. This took a very long time to pull off because I was going so fast from the fish bounces that there wasn’t much lag (because the bridge pieces were off screen quickly due to the speed). My initial approach was to slow down so that more pieces were on screen. This got a spring glitch.. eventually. But it caused me to carry less speed into it, making the rest of the level much slower. My second attempt involved some precise pausing to line up lots of laggy things to happen on one frame. This allowed me to keep a lot of speed into the spring glitch. This lets me outrun the screen soon after the glitch and make it to the end of the level before the screen catches up. I also do some precise movement off screen to reduce lag. The goal here is to not cause a single lag frame and to not end with more than 30 rings (due to the ring bonus being longer than the time bonus if this happens). I start the level with a bubble, which makes more lag, but I managed to lose the bubble without having a single lag frame. For the rest of the level, strategic camera manipulation, altering movement and killing enemies if possible reduces lag. I did the level without having a single frame of lag during the autoscroller section. It’s important to note that lag reduction on this level feels different on different versions of Bizhawk. The version used for this TAS felt easier for lag reduction than the old TAS, but that could simply be due to my improved TASing ability compared to 2016 me. The side that the Ivo comes up on is pseudo-random and uses the global frame counter (not the same counter as the frame rule). The first side doesn’t matter, but it’s roughly 20 frames faster to finish the fight with Ivo on the right since it’s then quicker for him to leave the screen. If unmanipulated, my TAS would get a right side then a left side, which is suboptimal. Due to the 8 frame frame rule of the boss spawning, I would have to wait another 8 frames to manipulate it. Instead I do a pause mid fight that manipulates the boss to end on the right, while only costing 2 frames. It’s possible to gain a lot of speed near the first waterfall by roll bouncing off the shield box. With this speed, it’s possible to get a high bounce off the crab at the bottom of the first waterfall. This is where a major improvement over my old TAS comes in. By getting a precise speed and position off the crab, it’s possible to bounce off the checkpoint box in a roll rather than rolling through it. This lets me get over the second waterfall while rolling and building speed rather than jumping. This cuts out one of the slowest parts of the level and even lets me outrun the screen. The downside of getting the crab bounce is that it makes me have the shield. This causes significant lag, but it’s definitely worth the extra speed from the shield, crab, box bounce chain. It does mean that I have to lose the shield at some point though. My old TAS kept going fast and waited until the Jungle 3 boss fight to lose the shield. But it turns out to be better to lose the shield in jungle 1, which costs 36 frames over keeping the shield through Jungle 1. This 36 frame sacrifice in Jungle 1 saves over 200 frames in Jungle 2! I pick the time when I’m outrunning screen to take the damage. The reason or this is because I have to get back on the screen to get on top of the ring box near the up spring. If I hadn’t taken damage I would have had to slightly slow down to get back on screen anyway. This leads to another area where I saved significant time. On the big waterfall, my old TAS has to wait for the falling logs and roll off them. In this TAS I managed to get a roll off a spring, which skips this entirely. This was due to me discovering that you can get a “spring roll” glitch as long as you’re not in a jumping state. I achieve this by getting on top of the ring box and rolling off it onto the spring. I initially did this by getting into the position of the ring box while off screen and then it appeared, I snapped on top of it. However, after losing the shield I could no longer do this. So I rolled down near the ring box, then I broke the roll and clipped into the ring box, which snapped me on top of it. You need a speed greater than 4 to get on top of a ring box (walking speed is 3). After getting the spring roll, sonic soon outruns the screen. This leads me to the end of the level and I just have to get over the signpost before the screen catches up, which is trivial. As said before, having no bubble significantly reduces lag in this level. This level has a gimmick where it scrolls up and can’t scroll back down. So if you fall down even a little bit, you die. This is a reasonable gimmick except for the part where it only scrolls up if you’re on the ground. This allows me to very easily outrun the screen, but I need to stop and wait for it to catch up so that the moving log objects can load. Also, at the end of the level you need to wait for the screen to scroll up enough to load the signpost. On Ivo’s first hit, I jump as late as possible while still hitting him on the first possible frame. This allows me to hit him with a high upwards speed, which bounces back into a high downwards speed. This allows me to jump for the second hit sooner and so on. There’s one troublesome hit where Ivo is moving from left to right and I have to delay hitting him on the first possible frame, otherwise I would hit the ball and die. The slime at the start has 2 levels of steepness. It starts not steep, changes to steep and goes back to not steep. 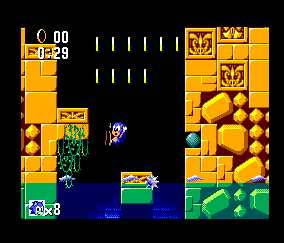 Sonic moves faster on the steep slime and if you try to jump off, his speed is preserved and he gets a y boost back down onto the slime unless he leaves the 32x32 tile that the slime is on. Using this, it’s possible to jump up slightly from the steep slime which lets me go over the less steep slime for a few frames while retaining steep slime speed. After the slime, I avoid pressing right and hitting the speed cap into the water. I then do some strategic rolling to get down quickly. After this there is a steps-like structure going down left. My Old TAS hit the lowest possible step and rolled off it. This meant that my old TAS spent a few frames on the lower step walking to the edge. This TA hits an upper step for a single frame and starts falling again. This saves a few frames since the main thing to optimize for here is getting as low as possible as soon as possible and any extra frames on the steps are wasted. At the bottom of the level there are some unfortunate spears which cause issues. After much trying I couldn’t clear them all in a single roll, so I had to jump over instead. Further on there’s an enemy which is blocking my path. I turn around to get a damage boost to the right. I then do a zip up the lift. There’s a delicate balance between triggering the lift as soon as possible and getting as left as possible. I ended up sacrificing 1 frame on triggering the lift, which let me get more left and save many lag frames due to being able to look up earlier. Looking up during the upzip has no effect on the mechanics of the zip, but it does reduce a lot of lag. After the lift there’s a section of moving to the left. I originally wanted to get a laggy spring glitch, but there wasn’t enough lag to achieve this. Furthermore, the ability to boost to the left makes this section pretty quick anyway. I then had to focus on lag reduction, so I used some pausing to manipulate the bubbles into not spawning. After the section of moving left, there’s a climbing section. It looks like doing this with no damage boosts would be fastest, but for some reason sonic gets a really low jump when leaving the water mid jump. This is probably because water has a lower initial jump velocity and a lower gravity, but swapping to out of water mid jump keeps the low jump velocity from the water, but combines it with the high out of water gravity. This means that I would have had to build some horizontal speed to make the jump out of the water possible (like the old TAS did). My solution was to take damage off the spike ball. This is roughly 20 frames faster when measuring from the first frame I can jump off the platform which is just at the water surface. However, extra post-damage lag and being further away from the next platform horizontally cancel out this 20 frame improvement. This is where the laggy spring glitch comes in. By using the damage lag and water surface lag I managed to get a bank error glitch. The type or solidity value I got was 0x10 which is the labyrinth slime which goes to the left and is steep. This made me bonk the wall but it was well worth it because I would have otherwise had to build up a lot of speed. After leaving the watery area I turn around and jump under the ring/life box to the next platform. This jump requires a bit of horizontal speed to make. Usually it would be impossible (as I thought in my old TAS) but by using some of the speed boosting properties of the slope, you can barely get enough speed to make it across. The goal here is to get a horizontal underflow using the left boosting glitch. I do a turnaround near the spikes as soon as possible and boost to the left. I have to carefully line up the position and I get just over 9 speed before hitting the edge and going through. Luckily, lag isn’t an issue here. Unfortunately I was in a bad spot in the frame rule compared to my old TAS, which lost 6 frames. There isn’t much I could have done about this. I originally optimized it without looking at my old TAS and I was 6 frames behind, then I literally copied the inputs of my old TAS and I was still 6 frames behind. Everything else was held constant, so this is due to the frame rule. The thing that slows it down is the signpost only checking to load once every 8 frames. This is one of my favorite levels in the run. The old TAS used the spring intentionally and went right to the boss as fast as possible. I instead bounced left off the spring, hitting the low roof, which let me bounce again sooner. In bouncing again, I could get a “spring roll” glitch since the first spring put me in a non-jumping state. This allowed me to roll extremely quickly into the boss arena. With this method, the first bounce costs a lot of time and makes the whole spring roll method take equally as long to trigger the boss as the intended method does (equal down to the 8 frame frame rule). The difference is that I have a lot of speed with the spring roll method, allowing me to bounce on the boss sooner. This is not quite enough to get 4 hits while he is in the middle, but by delaying the boss trigger by another frame rule, I do have enough time to get 4 hits in the middle. This is a huge improvement over my old TAS which only got 3 in the middle. When the boss comes in on the left I attempted to get 4 hits in, but unfortunately 3 is the maximum. In trying this, I found a new method where I could bounce on top of the boss. I hoped this would let me get 4 hits, but it didn’t. It looked cool, so I kept it in. Usually this level is not laggy enough to get a bank error laggy spring glitch. However, by carefully utilixing the lag from Ivo leaving the screen it is possible. This took thousands of rerecords, but I eventually got it. The solidity type is 0x05 which is a spring to the right (which requires standing on the left half of the tile). This could only be done on the left of the 3 floor tiles, because the other 2 tiles are a different type of tile (despite looking similar). The trick relies on pausing during the lag spike of Ivo leaving the screen. This unfortunately causes some flashing colours (hence the seizure warning on the encode). I’ve had experiences where pausing in this lag spike causes incorrect loading of the capsule graphics, loading Ivo’s graphics over the capsule, but in this TAS it loaded correctly. As I discovered in the Max Special Bonus TAS, rolling under the doors saves significant time. In the section with the conveyor belts and life box, I tried a new strat where I purposely slowed down to let the life box slide right enough that I could roll bounce off it. This didn’t save much time leading up to the door, but after the door it saved a few frames due to slight speed differences. In the section with the up spring I optimized for how soon I could turn left. My old TAS erroneously optimized for how soon the up spring could be hit. Scrap brain 1 was an interesting level because the route for Max Special Bonus and any% are the same. Naturally I compared the times and I found that I saved 5 frames over my Max Special Bonus TAS. This is mostly due to differences in the sync-friendliness of this game. But some of these frames are from my life box strat. Between the first and second door, I do a pause to manipulate the third fire into not appearing. This stops me having to awkwardly roll under it and it also reduces some lag. At the top of the first room I use more pausing to manipulate some of the other fire into not spawning. This doesn’t save much time on movement, but it does significantly reduce lag. I also manipulate the last fire into spawning so that I can take damage for the deathwarp. Taking damage on this fire is quicker than taking 2 hits from the deathwarp enemy. Unlike other “Act 3” levels the lag frames here are real and the inputs don’t get interpolated. Hence I have to lag reduce and play this like a normal level. The cannons in this level load based on an 8 frame frame rule. I purposely lose 3 frames at the start to make the first 2 cannons shoot 1 frame rule later. This lets me get past them with cleaner movement, saving much more than 3 frames overall. 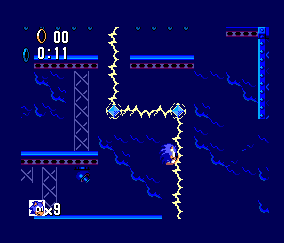 In the previous TAS, lag reduction was essential because my speed through the level was limited by the lightning cycles which slow down during lag. However, I was able to make it past lightning that was previously impossible to get past due to a laggy spring glitch. This let me go through a big gap of no lightning as the lightning was striking. I had to barely slow down to avoid hitting the next lightning. The difference in the lightning cycle also allowed me to damage boost instead of waiting for the slow right moving platform, saving more time over the old TAS. I manipulate the rotating cannons to fire most projectiles off screen, but this level is still incredibly laggy. I’m able to skip most of the level by jumping over the wall between the cannons and the door. Instead of turning around for this jump, I bonk on the wall to stop myself and turn quicker, this saves roughly 2 frames. It’s possible to get in the glass with Ivo and keep hitting him. You have to manage this around when the laser fires because no matter how much you try, you will always bounce back slightly into the firing range. For the first segment before the laser fires, I could only get 2 hits in. I tried so much with messing with the frame rule and precise positioning, but I couldn’t get any more than 2. I had a theory that I could get a bank error lag glitch in the glass. The solidity type that I would get is the Jungle water surface solidity type. This would hopefully make me hit the speed cap, allowing me to have a less drastic bounce back. But after lots of trying I couldn’t create enough lag to get it. There’s another strategy of taking a shield into the fight to land some extra hits. However, this would cause insane amounts of lag in Sky Base 1 and 2 which would make it not worth it. In a pure game time TAS it might be worth it, but it’s questionable now with the new laggy spring glitch in Sky Base 1. Isotarge – For making Scripthawk: https://github.com/Isotarge/ScriptHawk . Scripthawk supports this game (among many many others) and it was fantastic for TASing. Also for helping with figuring out the bank error glitch. Kroc - For making the Sonic 1 SMS disassembly. This helped me understand so much about this game, especially the Bank Error Glitch. Chrezm – For helping with figuring out the bank error glitch. Icy – For helping with figuring out the bank error glitch. Phozon – For providing useful feedback and strats. Tee-N-Tee – For helping me figure out the Labyrinth 2 underflow back in 2016. Masterjun: Wow, what a run. Very detailed submission texts are always much appreciated, good job. I like how one of the 4 routes through a level is faster simply because a platform spawns at a different time so you can roll over and save time. Yes vote! Wait I'm the judge.